Most mornings I am a creature of habit. Without the aid of an alarm, I am awake at 6:00. By 6:15 I am starting that day’s workout. Some time after cooling down, I make my breakfast. Typically, this breakfast is an egg white wrap or a fruit smoothie. The egg white wrap never was a problem; cook a few eggs in the skillet, throw them in a wrap, and add some spinach or veggie sausage and cheese, and breakfast is ready. The smoothie, however, was a bit of a problem. I’ve owned a few blenders, and all of them have claimed to be able to “crush ice”. Well, I guess technically they all crushed ice. I mean, the ice was crushed a little, but it wasn’t fully crushed ice. So, I would end up with chunky smoothies. Not quite what I was looking for in my breakfast. Then one day a package arrived in the mail that was addressed to me! Inside the box was the Oster Professional Series Blender. No, it wasn’t sent by the blender fairy but by my husband. I guess after witnessing numerous attempts to beg the former blender to make the ice smaller he decided a new blender was in order. 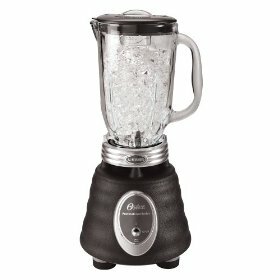 Why try another “ice crushing” blender when a professional blender was available? With an assortment of blades, each for a specific task, it seemed that this blender should work like a dream. However, having been disappointed by blenders in the past, I was a little skeptical. . .After the next morning’s workout, I assembled all of my ingredients and filled the blender according to the directions. A flip of the switch, waited a few seconds, and ta-da! I had a perfectly smooth drink! While having a smooth smoothie may not be the height of excitement, it does make one’s morning meal much more enjoyable. Plus, I have found the blender to be useful when puréeing soups or sauces or even making, ahem, frozen drinks! This blender is worth every penny that was spent on its purchase. We bought one at Christmas at Sam’s Club. Laura thought it was an odd present, but it is an impressive blender. I use it to smooth out the spaghetti sauce we make at home as well as for other concoctions.